Bottom Line: A fruit-forward pinot noir with ripe berry aromas and a juicy appeal. 87 • Paradise Ridge 2016 Pinot Noir, Russian River Valley 13.4% (USA) $45.00. 91 • Paradise Ridge 2016 Walter’s Vineyard, Pinot Noir, Russian River Valley 13.4% (USA) $54.00. 93 • Paradise Ridge 2016 Vineyard Select, Pinot Noir, Russian River Valley 13.7% (USA) $65.00. 85 • Paradise Ridge 2018 Grandview Vineyard, Sauvignon Blanc, Russian River Valley 12.5% (USA) $22.00. 90 • Paradise Ridge 2018 Vineyard Selection, Sauvignon Blanc, Russian River Valley 12.5% (USA) $28.00. 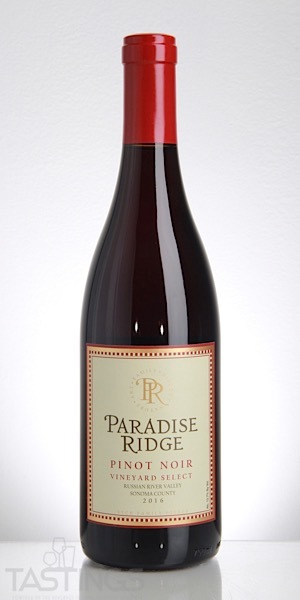 Paradise Ridge 2016 Vineyard Select, Pinot Noir, Russian River Valley rating was calculated by tastings.com to be 93 points out of 100 on 12/17/2018. Please note that MSRP may have changed since the date of our review.